India has sealed the ODI series in style after registering two comprehensive wins over the hosts, New Zealand. The Indian Women have had a tremendous series so far and have outplayed the hosts in all the departments. India would be eyeing a series whitewash, as they have already clinched the three-match ODI series and are leading by 2-0. New Zealand, on the other hand, have had their opportunities in the series but they failed to cash in at that movement. The White Ferns would be hoping to register their consolation win as they will be playing for their pride in the final ODI. Their bowling has been the main concern and the Indian batting lineup has turned out to be too good for the home side. New Zealand needs to play some aggressive cricket in the last ODI to boost their confidence for the upcoming T20I series. Indian bowlers demolished the Kiwi castle in the second ODI at Bay Oval. 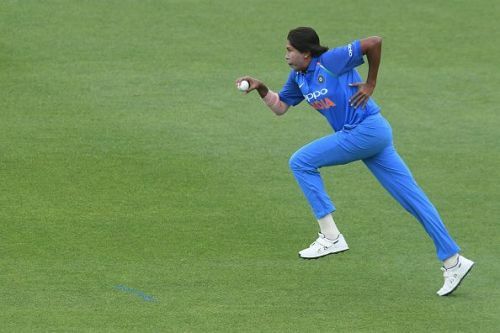 The Indian spearhead, Jhulan Goswami led the pace attack to give the initial breakthrough. She finished with the figures of 3 for 22 and helped her team to bundle them for 161 runs. The spin trio of Ekta Bisht, Poonam Yadav, and Deepti Sharma troubled the hosts and picked 6 wickets in total. Jhulan Goswami runs in to bowl. Indian started the chase horribly and lost two quick wickets for just 15 runs on the board. Smriti Mandhana, the frontrunner with the bat, played another match-winning knock to take her side over the line. She stitched a crucial partnership with the skipper, Mithali Raj to seal the ODI series by 2-0. Mandhana was declared the Player of the Match for her unbeaten 90 runs. Date: Tuesday, January 28, 2019. New Zealand Women: Amy Satterthwaite(c), Hannah Rowe, Anna Peterson, Holly Huddleston, Leigh Kasperek, Lauren Down, Maddy Green, Katie Perkins, Sophie Devine, Amelia Kerr, Lea Tahuhu, Bernadine Bezuidenhout, Suzie Bates.